In my previous post I said I was feeling tired, well it does show when I have a lack of time and I loose my mojo. I also have a poorly cat at the moment, and after two visits to the vet she is not much better ( nor my purse, when it’s about £100 with every visit with treatment……I think my mojo was left at the vets) ? Here are my rushed tired paintings, they might not be good, but it takes my mind to another place, and it is relaxing, so who cares, I paint for me! The horse is watercolour, and the cow is derwent tinted charcoal. 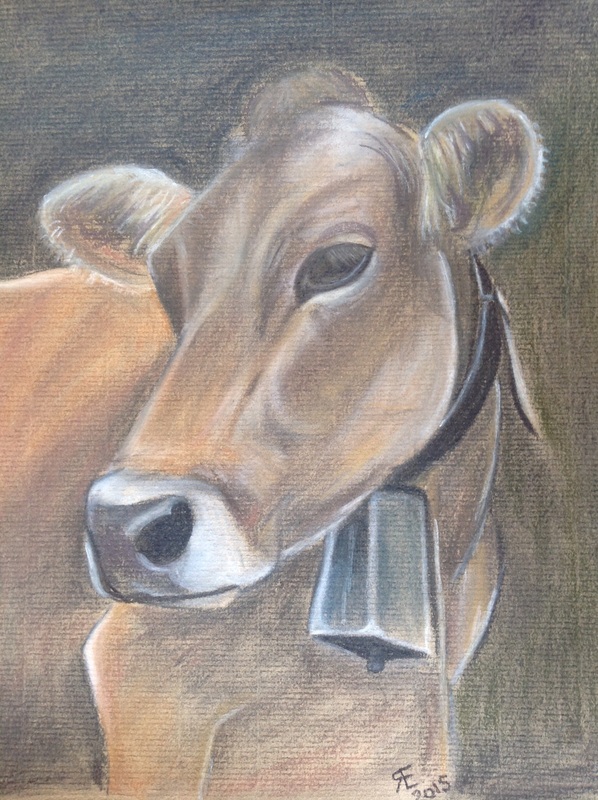 This entry was posted in art, Charcoal, Cow, derwent charcoal pencils, derwent tinted charcoal, Drawing, equine, Horse, picture, portrait, sketch, watercolour and tagged art, Cow, derwent tinted charcoal, drawing, equine, Horse, painting, Painting, picture, sketch, watercolour. Bookmark the permalink. 12 Responses to Feeling tired, wishing I had more time to paint, lost mojo! I love them both. Very contemplative and gentle soul hearted feeling in both. Wishing your cat feels better soon and you get your well-deserved rest. Aww me too, she is up and restless now, I am not sure the vets will get to the bottom of it, I just hope it all sorts out for itself, but that is wishful thinking. 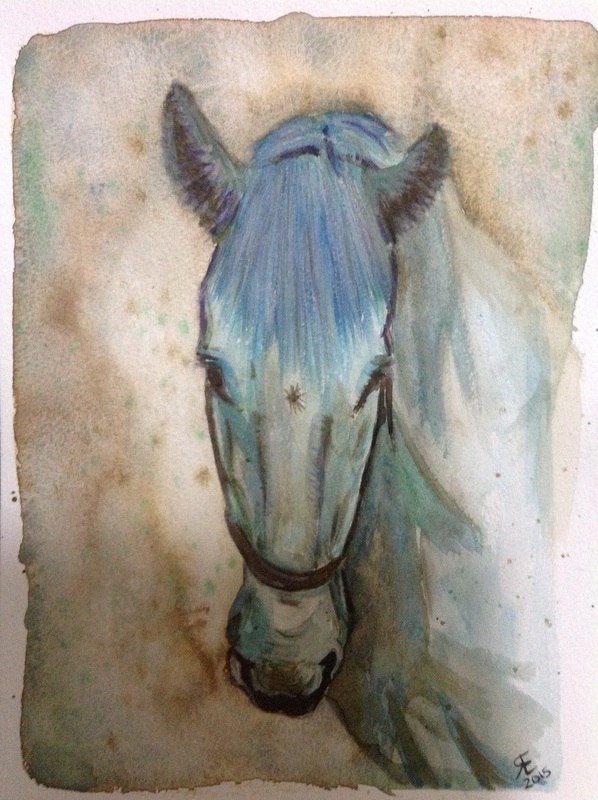 The blues and turquoise with browns are my fav colours of the moment, after treating myself to a tube of turquoise paint, it features regularly…..planning a moose next with brown and a lighter turquoise. You should try the pencils, it is quite a quick process, well compared to the speed I work at with other media, and easy to correct mistakes to some extent, even lights over dark. Thank you, he is an image from paint my photo, which provides reference photos for painters. These are both gorgeous!!! I’d have never known you weren’t feeling that great. You and I both have sick kitties. I feel for you. I’m feeling like a very worn out nurse. It’s very hard to get a cat to eat and take medicine when it wants neither. And as you say, the vet bills are ridiculous. I hope your kitty is straightened out soon but your artwork still shines! Awww I hope your cat feels better soon, mine is at least taking both her medicines, although not willingly, and it has ended up all over me a couple of times! Hopefully I will get chance to paint tonight, also trying to wipe my Mac to sell it, and that is not behaving either, grrr to technology. These are beautiful with so much spirit. Sure hope your kitty turns around. I have three. Thank you Beverly ……kiko is stable ish at the moment, so fingers crossed we don’t have more vet visits, I have five, all ginger apart from kiko who is a black witches cat ( her eyes are always watching) couldn’t be without them. Thank you, cat is back on medication, now into week four.